What does it mean when you’re flight’s delayed? This past weekend it meant that I had more time to read! 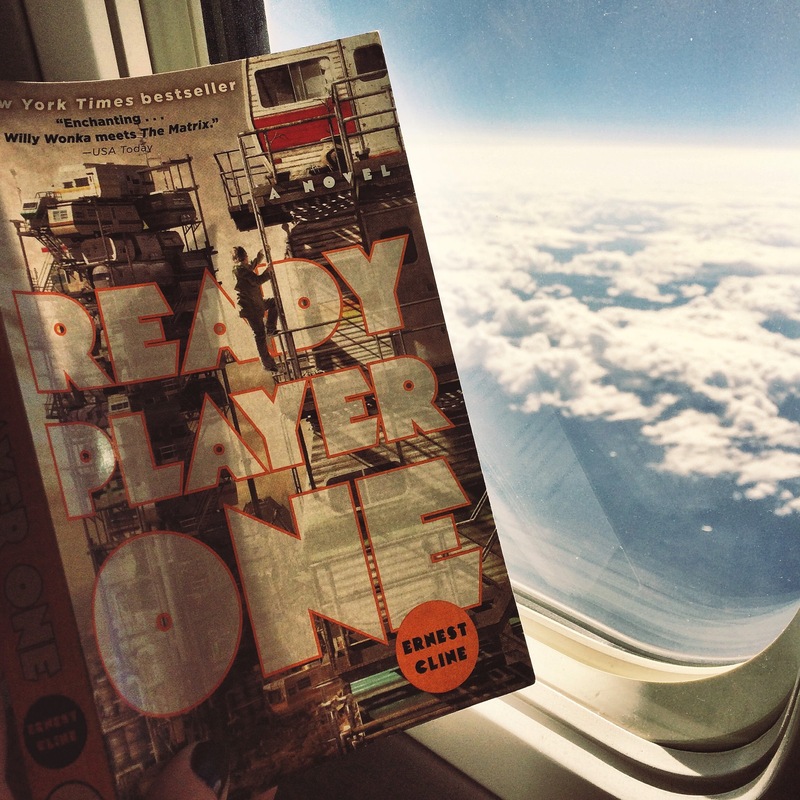 With the extra time, I was able to dive into Ready Player One by Ernest Cline, a sci-fi novel set in the year 2044. In this story, Earth has plummeted into decay and Cline paints a horrifying picture through his “stacks”, trailers that are stacked up on top of each other and are only stabilized by weak metal pipe structures. People escape this harsh reality through Oasis, a virtual world where people can be whoever, or whatever, they want. The creator of Oasis, James Halliday, has passed away and left behind the challenge of a lifetime. Whoever can solve his highly complex scavenger hunt filled with puzzles, video game challenges, and 80’s pop culture trivia, will win Halliday’s fortune and control of Oasis. Wade Watts, an anti-social teenager, finds himself catapulted into fame when he finds the first piece of Halliday’s puzzle. As someone who is not very savvy in video game jargon, I thought Cline did a pretty good job of keeping technical descriptions straightforward. Despite a few scenes where my mind wandered in the face of ultra-detailed descriptions, I was able to keep up for the most part. I don’t read a lot of sci-fi books, but I enjoyed Ready Player One. The story was interesting, the dialogue was entertaining and the topics were relatable. Cline brought depth to the story by touching on issues that the world is dealing with today, including global warming, pollution, monopoly power, and the risks that technology presents to overpower our lives so much so that we forget to live in reality. < Previous Should You Keep a Book Journal? I had almost the complete opposite reaction to this book, even going so far to point out that “There are definite elements of Fahreneit 451/1984 prophetic elements of dystopian futures, but I don’t read this as almost prophetic powers of extrapolation (as Bradbury,Orwell) but simply above-average keen observation.” Its always interesting to read others takes on books. Especially RP1. It seems to divide the masses. Definitely! I agree, it’s always interesting to see how so many different reactions can come from reading the same book. I really enjoyed Cline’s other book, Armada, but I’m so nervous about reading this one! I actually started it once, but it stressed me out (it’s version of the future is pretty bleak). I might have to try it again but make sure I’m in the mood for a not-super-optimistic read. It’s definitely is pretty bleak, but I thought it ended at a pretty good and hopeful point! Loved this book. You know they are making a film version of it, right? I didn’t, but now that you mention it, I’m not surprised! They could make a really great movie out of this story. Heyy giirl 😀 Nice review and I put this in my TBR list with Armada too! ahah 🙂 By the way, we tagged you in a little BAck To School Special thought you may be interested 😉 https://bookidote.wordpress.com/2015/09/12/back-to-school-special-2/ Have fun! I love this book! Even though I have no idea about the game references 80% of the time, I still really enjoyed it! 🙂 Great reviews! I didn’t understand many of the game references either (I’m definitely not a gamer) but I still enjoyed it too! !